Airpark TV Show- What is it? 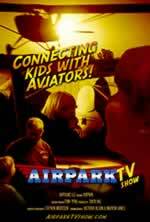 Airpark TV will be created in the same spirit of the giving aviators who reach out to our youth and change lives. Airpark is a film project for a a pilot episode of a children’s television that will bring the world of aviation, the past and present heroes, opportunities, encouragement, activities to the living rooms of kids. We plan to use kid and teen hosts for the show. It will be shot in a fun style that appeals to youth, but at the same time delivering a good message and keeping them engaged. We are currently developing 7-10 feature segments for the show, and hopefully subsequent series. There will be a segment following real kids as they get to meet the heroes of today, take their first flight and work with the aviators at their events, or even workshops we set up. There are learning and craft activity segments featuring projects or activities that moms, dads and mentors can do together. Other segments include reality/documentary of existing events, aviation science concepts, aviation jobs, craft, air shows & fun stories. Special segments such as, a young girls workshop with a female pilot mentor are also being developed. We’ll even be visiting the aviators that fly camera’s for movies! We want to get the old-timer’s stories of their days at the air fields, re-enact those events, but in a fun and interesting style that will appeal to younger viewers. Much like the aviators reach out to the youth, we hope to offer the same to the “older kids” providing an avenue for real apprenticeships for film student’s who have demonstrated “the right stuff”. If it weren’t for those who came before us, passing down the film making craft, none of us would be here. We hope to pass on our experience to those wanting to be in the motion picture / television industry as well. Guided by the real pros on the project, pre-qualified films students will be able to get real hands on experience on real productions, complementing their studies and aiding them to get paid a bit to help with their schooling. We seek to shoot the re-enactment segments in real film, to provide real film experience to apprentices. This might seem silly in the days of digital media, but, those of us who come from “real film” understand the discipline and work ethic needed for film, that separates the digital filmmakers from the real film makers. This aspect of the production will provide tremendous benefit to the apprentices that are chosen. We will happily discuss the show outline in private dicsussions with parties that might be interested in sponsoring the whole show.